The Jam and Sugar Thermometer is ideal for making sweets and confectionary due to the different temperatures indicated on the sugar thermometer, for better reault of producing, your desired sugar type. 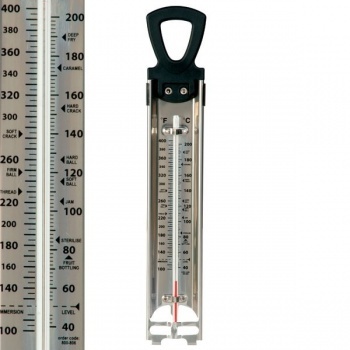 Some of the types indicated on the sugar thermometer is oft ball, hard ball, hard crack, caramel all embossed on the this thermometer. These indications allow you to get the sugar precisely right to create mouth-watering sweets and confectionary. Not only good for making different type of sugars, this thermometer has markings for jam makingwhich is very important to get the correct temperatures otherwise without a thermometer you may find you jam is not setting or your sugar is burnt. This Sugar and Jam thermometer can improve your results and save you £'s by getting the correct temperatures. If wrong then you may have to throw all your hard work away and start again. This deisgn of sugar thermometer does not allow the glass bulb of the thermometer to touch the bottom of the pan, thus proctecting it from easy damage. Be very careful any temperature above 350ºF (177ºC ) will begin to burn the sugar once its burnt it will develop a bitter and burnt taste not good for making sweets. The idea is to test your sugar creation and see what it does, this will also help you with the correct sugar temperature required and also shown on the thermometer. Thank you for your very prompt delivery. I have just been thinking of trying to cook my own sweets. I look forward to using the thermometer and hopefully getting the right results from my efforts.